When providing that kind of a performance gain, you should provide a distribution of the values as well. A reader could take it as the best optimization to perform on any set of HashedSet.Add operations. In your case, states are probably repeated very frequently, hence the performance gain. I take it this code isn't supposed to be thread-safe? What's the point of using HashSet<T> where T does not implement GetHashCode or any specific equality stuff? @Mike it does have an special purpose comparer passed in the constructor. Aka HashSet<T> cannot be improved much more than it's current state. <br/><br/> @Thomas, no. The code is not thread-safe by design. 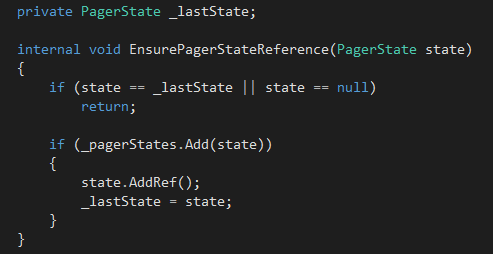 Remember that given the highly threaded nature of RavenDB most of the code is in itself single-threaded with very minimal (we make special enfasis in MINIMAL) amount of shared state. <br/><br/> @Scooletz. Noone can apply this optimization without having a clear understanding of the distribution of the calls. Distribution always matter, I am currently applying an optimization on another low-level routine in 4.0 that gets us 3x improvement just because we can assume without any danger that there is certain locality based distribution of calls. In real life that means that our benchmark of Voron that took 4 minutes is now taking 3:30 (it shaved 30 seconds out of the whole benchmark). Wouldn't a better GetHashCode() implementation make it faster? @Dmitry nope, already overloaded with a very fast GetHashCode() implementation... even inlined in the specialized comparer. Scooletz, If some reader is going to do blind performance optimizations without stopping to understand the reasoning behind that, they have already lost. Thomas, No, it isn't. 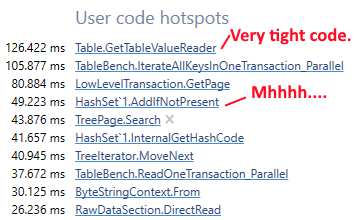 HashSet<T> isn't thread safe either, mind.